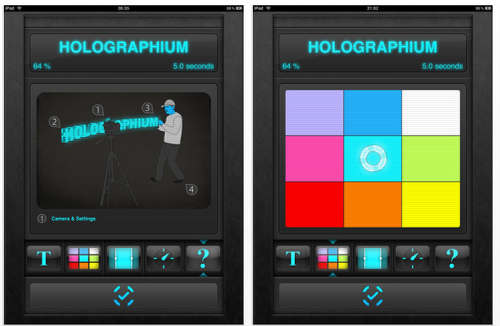 Holographium is an intelligent, beautiful and fun to use holographic text extrusion app for your iPhone, iPod touch and iPad. Drag out any text you like in front of your digital camera, and see the amazingly cool results on your long exposure. This app usually retails for $6.99 but is currently going free, click here to download. After you’ve configured your custom 3D text, Holographium performs a massive calculation. The 2-dimensional text is converted into a bunch of interconnected vertices in 3-dimensional space, optimized, and then sliced into hundreds of frames. When your digital camera is ready, these frames will be projected over time on the holographic extrusion matrix, appearing quickly on your screen as bright lines and squares. While this doesn’t seem to make sense for your eye, your digital camera will produce amazingly cool long exposures when you drag them out in front of it. The built-in timer and countdown helps you to synchronize the start of your long exposure with the start of the holographic light extrusion. Microsoft – We Want Your Apps!